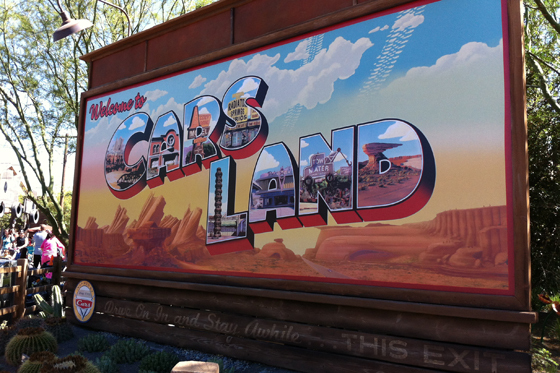 California Adventure theme park opened Cars Land in June of this year, and N and I were excited to check it out. 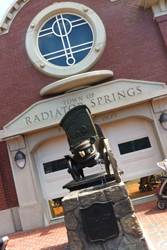 Disney and Pixar have no doubt made truckloads of money (ha ha, pun originally not intended) off the Cars franchise, so it was almost inevitable that they’d create this new section, and the town of Radiator Springs where the first Cars movie is set really seems like it would be a cool place. I do have to say though, that we really were surprised at what a great job they did. 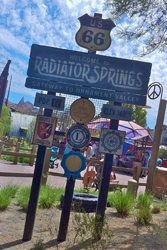 Just walking to the entrance of Cars Land, seeing the old time city marker sign, and then actual the Radiator Springs sign brings you into the Cars universe. 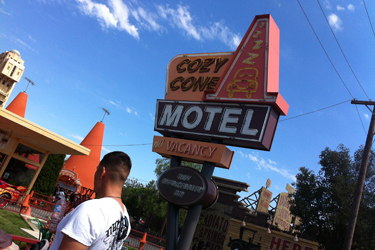 Then, you look down the road and realize they really did recreate the entire town – from Sally’s Cozy Cone Motel to Flo’s V8 Cafe, they have really done an absolutely fantastic job. 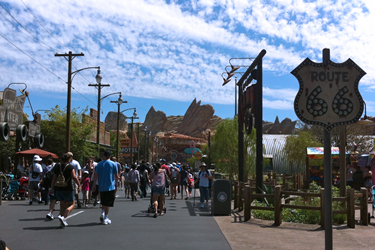 What a gorgeous day to experience CarsLand for the first time – I swear we walked right into the movie. Can you believe how much it looks like it? 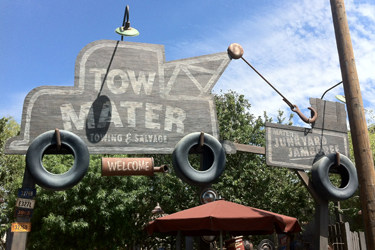 There’s Tow Mater’s Junkyard Jamboree – in line, you really feel like you’re hanging out in Mater’s junkyard. Neat. 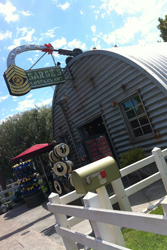 Sarge’s Surplus Hut is a great setup for a gift shop. 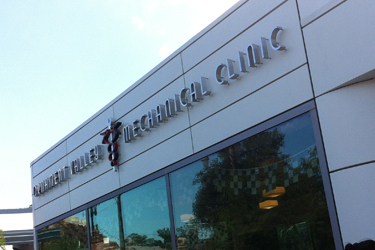 And there was even the Ornament Valley Medical Clinic. So cool. 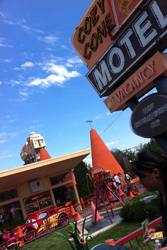 Yay, the Cozy Cone Motel! And who’s hanging out in front? Lightning McQueen himself! I thought he was a permanent fixture just sitting in front of the Cozy Cone, but realized later he was actually a character that MOVED around. So awesome! I don’t know what happened with my iPhone cam at this point, but it was totally appropriate. 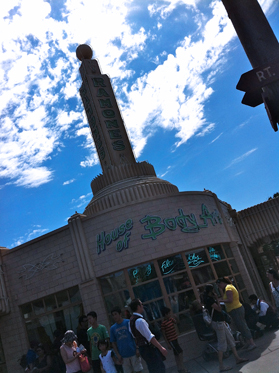 It was HOT today. 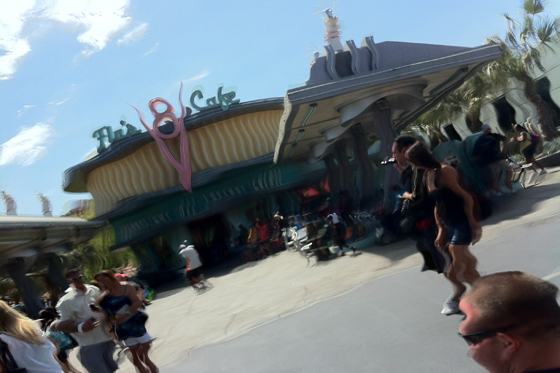 Here’s my shot of Flo’s V8 Cafe. Pretty sweet, huh? This is totally how we felt. 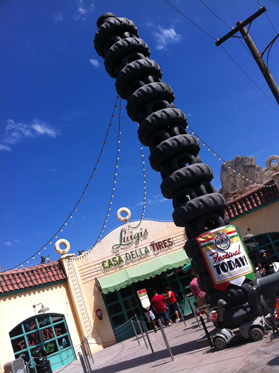 There was even Luigi’s Tires and Ramone’s House of Body Art! RAD. 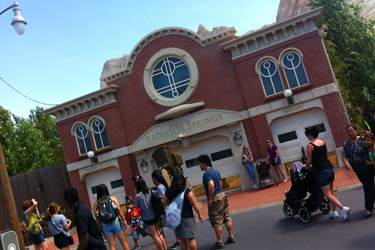 AND the Radiator Springs Town Hall, complete with the fountain statue of Stanley, the founder of Radiator Springs. How. Cool. Is. That?! 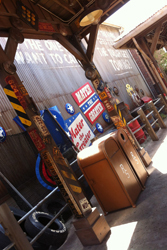 And the ride that has everyone talking, the Radiator Springs Racers. 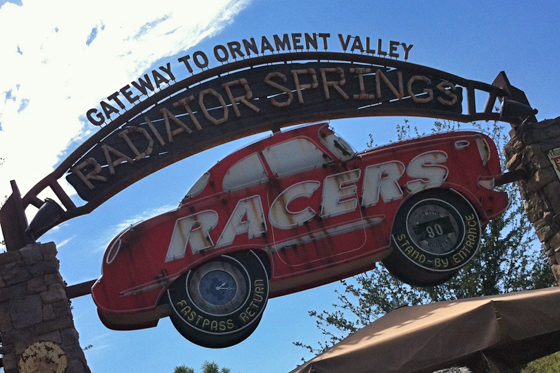 We didn’t get into the park until around one or two in the afternoon, so by that time all the Fast Passes for the Radiator Springs Racers had been distributed (people line up over an hour before park opening just to get in to get a Fast Pass), and the wait was over two hours, so we didn’t bother trying to ride that. We’ll try in the next few days and I’ll update if we get to go on it!